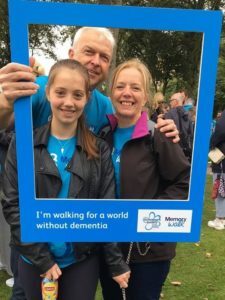 Back in July we posted about Pali Grimsby’s own; Julie Glover, who was due to take on the Alzheimer’s Memory Walk this year alongside an estimated 110,000 people to unite against dementia. The walk which is organised by the Alzheimer’s Society was organised with the aim to raise over £9 million pounds to help anyone affected by dementia. The walk which is organised by the Alzheimer’s Society was organised with the aim to raise over £9 million pounds to help anyone affected by dementia. Julie, whose story can be found below has now completed the walk and raised just over £750! Well done, Julie! I am taking part in the charity walk in aid of Alzheimer’s Society, as advertised on the TV; around 225,000 people develop dementia every year – that’s equivalent to one person every 3 minutes!!! Being part of a family that has been affected by this silent disease and that this is something that could affect each and every one of us at some point in the future, I felt I had to do something, however small, to help fight this. Alzheimer’s Society is a registered Charity (No.296645) which aims to help people living with the effects of Alzheimer’s and dementia. Pali Grimsby are an active and charitable bunch. Read more about their exploits over at our blog. This entry was posted in blog, Charity, Conveyancing, Local News and tagged Charity, Conveyancing, Pali, Pali Grimsby. Bookmark the permalink.